I realize I've been posting a lot of chicken recipes lately. Sorry about that for all of you who don't eat chicken. But for most of these recipes, you can easily substitute the chicken for pork, shrimp, etc. Just something to keep in mind! I think the reason I've been cooking with so much chicken lately is either because a) Chicken is so diverse and there are so many different recipes I can make using it; or b) When I made my trip to Costco a couple weeks ago, along with the 17 pounds of vegetables I bought, I also bought a bag of about 25 frozen chicken cutlets. I'll let you decide the reason on your own. Anyways, I was really craving buffalo chicken the other day, and I had a few different options of what I could make. I always love Buffalo Wings or Buffalo Chicken Dip, but I also had some bread and lettuce that weren't going to stay good for too much longer (man, I guess I should really clean out my pantry/refrigerator, huh? 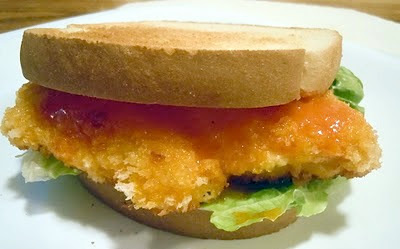 ), so I decided to make a Buffalo Chicken Sandwich. I used the technique I use for making chicken cutlets (like in Chicken Piccata) and just doctored it up a little. It turned out so good! I plan on slicing up the extra chicken pieces and having them on a salad for lunch this week, too. I've got to use up that lettuce somehow! Serve it on bread with lettuce, a little ranch dressing, and the hot sauce mixture. Look how good this looks! You can also slice it up and put it on a salad or in a wrap as an alternative. Preheat oven to 375 degrees F. Lightly grease a baking sheet with cooking spray and set aside. Mix flour, salt, pepper and paprika in a shallow plate. In a small bowl, lightly whisk the egg and stir in 1/2 cup of hot sauce. Spread panko in a separate plate. Dip each cutlet in flour, then egg mixture, then panko, allowing excess to drip off in between each plate. Heat 2 tbsp. olive oil over medium-low heat. Cook breasts on each side until light brown, about 3 minutes per side. Place cutlets on the prepared baking sheet and continue cooking cutlets until they are all browned. Place cutlets in the oven for 7-10 minutes or until cooked through. In the meantime, melt remaining 1/2 cup hot sauce and butter in a small saucepan until melted. Turn off burner and set aside. Spread a little Ranch dressing on one side of your bread. Top with lettuce and a chicken cutlet. Top with the hot sauce mixture and another piece of bread. Enjoy!